An aluminum floor jack is a must for every garage. You might think that choosing the best floor jack for you is as simple as selecting the jeans to wear tomorrow until you see the wide range of choices. You can quickly get overwhelmed and buying an aluminum floor jack for the first time can quickly lead to a mistake. Hence, we have created a list of the top ten best aluminum floor jacks available in the market today. Allow us to be your guide in choosing the best aluminum floor jack that can suit all your needs with your wheels. 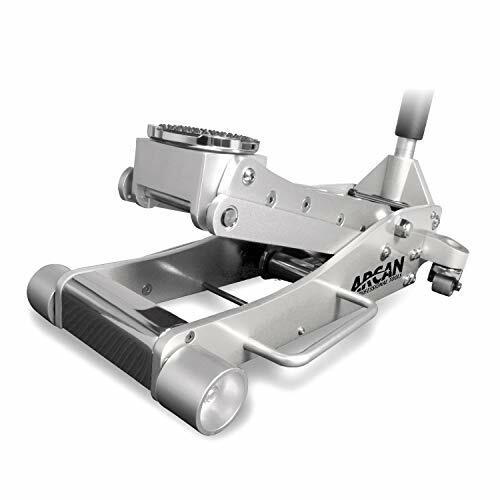 First, we have the Arcan aluminum floor jack with three-ton capacity that only weighs56 pounds. It features a reinforced lift arm for added strength and chassis torsion control for durability. It has dual pump pistons for fast-rising action, 3.6 inches to 19.4 inches. The piston dust will help you to prevent hydraulic contamination. There are also bypass and overload valves that help to prevent over-extension of hydraulic ram and jack use beyond rated capacity. This aluminum floor jack is durable and built to last. It’s an excellent choice for heavy-duty use and gives you extra peace of mind. Having a higher capacity means allowing you to have higher heights. 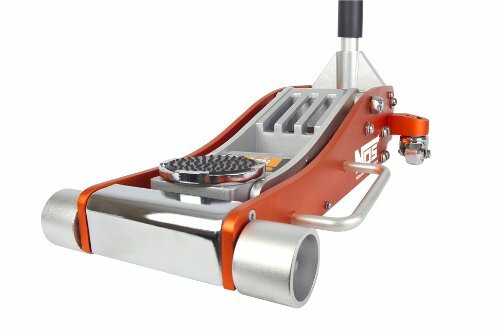 Now you can work as a professional with this aluminum floor jack. Buyers can enjoy one-year limited warranty upon purchasing the product. 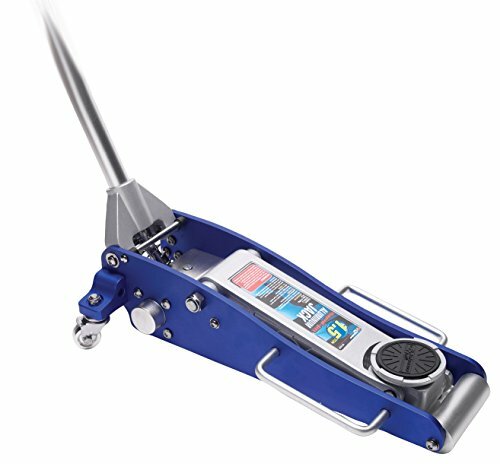 Next, we have the Performance Tool aluminum floor jack that has the capacity of 3 5/8 inches to 17 ½ inches lift range. It features a 47 ¾-inch cushion grip handle to provide you full control of the product and three pumps to maximum height with no load. This aluminum jack floor also has a 360-degree swivel saddle with rubber cushion and its lightweight aircraft aluminum makes it perfect for the garage or home use. The manufacturer is known for producing heavy-duty products, and this one is not an exception with a max capacity of 3,000 pounds or 1.5 tons. Overload protection bypass will allow you to use this jack with peace of mind. We like the ergonomic back design for easy maneuverability and positioning while you are confined to working areas. The package includes an owner’s manual to help you get the most out of your product once it’s arrived. 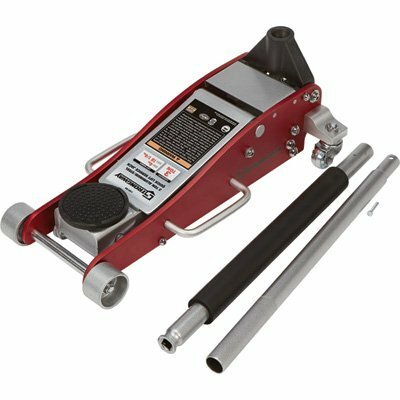 If you are on a tight budget, you should check out the Milestone Tools aluminum and steel garage jack that has a rated capacity of 3 ton or 6,000 pounds. It has a lift range of 4 inches to 18 ¼ inches. This jack is made of a lightweight aluminum frame that can reduce the product weight and increase the portability, allowing you to carry the product almost anywhere. We also like how it’s equipped with heavy-duty steel lift arm for strength and durability. The quick-lifting hydraulic system saves time, and it’s equipped with safety valve to help you prevent overloading beyond the recommended capacity. It also features a rubber padded saddle that can protect your vehicle’s frame. There are rear wheels that allow you to easily position the aluminum jack especially if you are working on rough surfaces. 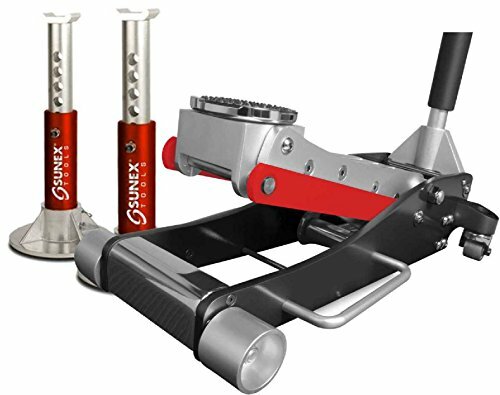 The Sunex aluminum service floor jack has a lift capacity of 3 tons or 6,000 pounds and a height range of 3.75 inches to 18.125 inches. Weighing only 27 pounds, this jack is lightweight and portable despite being designed for heavy-duty use. It has thick frame side plates and reinforced lift for added strength, chassis torsion control, and durability. Similar to the previous product we’ve reviewed, this model also features a safety valve to prevent overloading. There is also a two-piece handle with a bumper pad. The side handles allow you to transport the jack with ease from one place to another. The dual pump system makes it easier for you to lift the tire without difficulty and the universal joint release mechanism provides precise control when lifting the car. Rest assured that this aluminum jack is safe to use as this is the product that has complied with the ASME PALD 2009 Standard so far. If you are willing to spend extra dollars, you should check out the OTC aluminum racing jack. It is made of aircraft0grade aluminum that can lift two tons. Weighing only 43 pounds, you can easily transport the jack anywhere you like, an excellent choice for working mechanics. It will just take five pumps for you to reach the maximum lift range of 18 inches. Also, the low profile 3 ½-inch makes it an ideal option for ground-hugging high-performance car. The two-piece 45-inch long handle snaps together for quick and easy setup. There is a removable rubber saddle pad that can protect the vehicle and prevent dangerous slipping. This racing jack is perfect for people who are looking for a fast and powerful lift. Another product from OTC is the aluminum racing jack that has the maximum capacity of two tons. This pair of aluminum jack comes with a jack stand for your convenience. It also features a dual pump piston and can reach the maximum height of 18 inches in just five quick pumps. The jack has a low profile of 3-1/2 inches that makes it an excellent choice if you have a ground-hugging and high-performance vehicle. The jack has a removable rubber saddle pad to protect the frame of your vehicle. It also helps to avoid dangerous slipping while you are working. The side-mounted handles allow you to carry the jack anywhere without difficulty. It is made from aircraft-grade aluminum, and its solid construction will enable you to use the jack for many years to come. 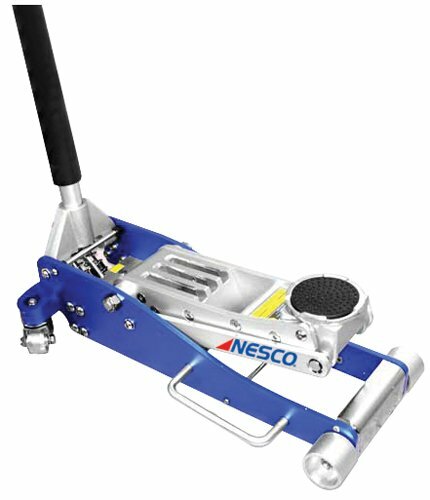 Next, we have the Nesco Tools aluminum low profile floor jack with a long frame. Its ultra-lightweight aluminum alloy construction allows you to carry your jack in your workshop or garage anytime you want. The lift range of this jack is 3 and ½ inches to 19 and ¼ inches. It takes about 9 pumps for you to reach the full height of this aluminum jack. 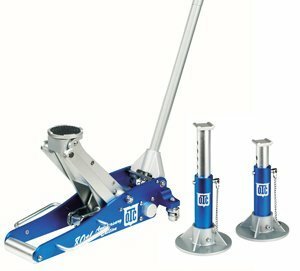 This double plunger low profile aluminum floor jack is lighter compared to other products and causes lesser fatigue when used. The package comes with three pieces—the main body and the 2-part handles. It will only take you around five minutes to assemble the product and requires no tools at all. You can release the rod by turning the jack on its side, and the rod flies off. 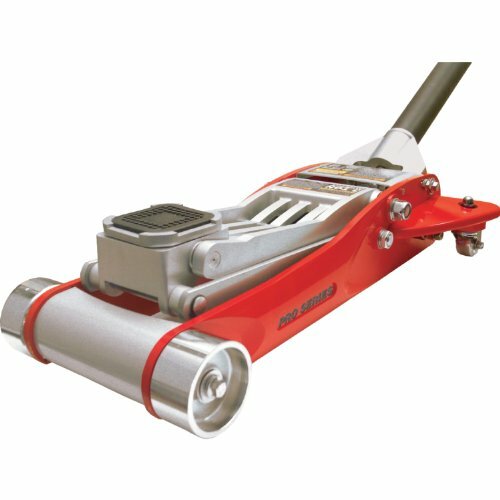 This high-quality aluminum jack can last for a long time with proper use and maintenance. Another product from Sunex is the aluminum 3-ton jack pack. 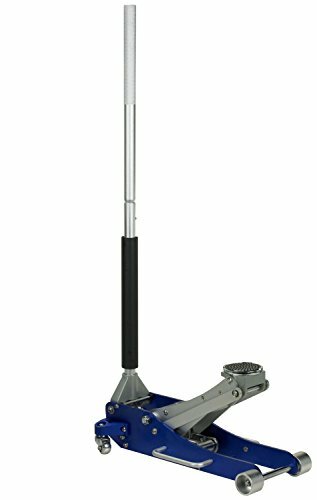 Compared to other steel jacks, its lightweight aluminum body is nearly half the weight, allowing you to carry it around anywhere you want. Thanks to its rapid rise in technology, you can reach the maximum height in only 77 pumps even without load. It includes a pair of 3-ton aluminum jack stands. This low-profile jack is great for heavy-duty use. It also features the quick-lift technology, helping you to save time and energy in the long run. It also passed the rigorous ASME PALD compliance test, giving you peace of mind that the product is safe to use. With proper care and maintenance, this aluminum jack can serve you and your garage for many years to come. 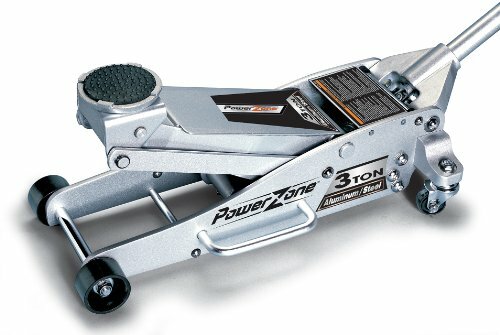 The Torin aluminum racing floor jack says something for its price. The package includes one service jack, 2-piece quick connect handle with foam bumper pad and one user manual. We like the low profile design that makes it easier to use especially for high-performing cars. The dual pistons will allow you to have a faster-rising action. Its lightweight aluminum chassis will also keep all your jobs solid and fast. The lifting capacity of this product is 6,500 pounds, and its lifting range is from 3.93 inches to 18.3 inches. Thanks to its heavy-duty nodular steel pump, a steel lifting arm, and an aluminum chassis, it can help you to gain agile feel when working. Its rapid acting dual pistons offer a faster-rising action. Two handles will make lifting easier for your transportability. Lastly, we have the Strongway floor jack made of aluminum and steel for quick lift service. It is constructed with high-grade steel and aluminum to last for a long time with proper use and maintenance. The product is coated with lead-free paint finish after chemical wash to ensure a long-lasting finish. It’s great and dirt-resistant, making cleaning maintenance a breeze for you. Its high-quality large diameter hydraulic steel cylinder unit results in lower oil pressure that you need in moving the load. It also helps to reduce the wear and tear of this garage gear and extend its service life. The piston-ram is treated and polished to resist skiving. It has a lift capacity of 3 tons.